*University of Guelph, 50 Stone Road East, School of Environmental Sciences, 1216/17 Bovey Building, Guelph, ON, N1G 2W1. abrunke@uoguelph.ca, samarsha@uoguelph.ca. **Field Museum of Natural History, Zoology Department/Insect Division, 1400 South Lake Shore Drive, Chicago IL, 60605. anewton@fieldmuseum.org. ***Laurentian Forestry Centre, 1055, rue du P.E.P.S., Stn. Sainte-Foy Québec, PQ, G1V 4C7. jan.klimaszewski@rncan-nrcan.gc.ca **** Nova Scotia Museum, 1747 Summer St., Halifax, NS, B3H 3A6. c.majka@ns.sympatico.ca. Rove beetles (Coleoptera: Staphylinidae) constitute the largest family of insects worldwide, with more than 55,440 described species (Grebennikov and Newton 2009) found in a great diversity of terrestrial and periaquatic habitats. In Canada, more than 1400 species are known and some large subfamilies (Staphylininae, Tachyporinae) have been nearly completely revised. An excellent synthesis of the staphylinid literature is given by Thayer (2005); however, our understanding of staphylinid ecology and habitat requirements is still very limited. Recent work has revealed that staphylinids are dominant organisms in Canadian forest ecosystems (Paquin and Duperre 2001) and because many species require continuous, mature or old growth stands, the composition of their species assemblages effectively communicates the degree of natural or human impact upon these systems (Pohl et al. 2008). In a recent review of the use of beetles in conservation, New (2010) highlighted the critical importance of species-level identifications in surveys aiming to document changes to ecosystems via human development or climate change. The continued ability of insect surveys to address important ecological and conservation-themed questions depends primarily on the correct identification of specimens, which in turn depends on the availability of effective keys. Although several recent works such as Klimaszewski (2000) and Newton et al. (2000) include keys to the genus or subfamily level, accompanied by line drawings of important characters, keys to most staphylinid groups are poorly illustrated and cover broad geographic areas (e.g. North America north of Mexico). Furthermore, many important staphylinid keys are scattered in the primary literature and can be time-consuming or difficult to locate. These obstacles can now be addressed using online, open-access publication to provide richly illustrated, digital keys to the species of Staphylinidae known to inhabit eastern Canada and the adjacent United States (ECAS). ECAS is defined here as Ontario eastward and includes the following states that are adjacent to eastern Canada: Michigan, Indiana, Ohio, Pennsylvania, New York, Vermont, New Hampshire and Maine. Although broader regions have been used in previous works (i.e., Northeastern North America of Downie and Arnett (1996)), ECAS corresponds well to a naturally delimited staphylinid fauna and has allowed the simplification of the keys through exclusion of southern or western taxa. Despite the largest and some of the most conspicuous species being in the Staphylinina (Staphylininae: Staphylinini), the taxonomy of this subtribe is currently far from settled. The largest genus, Platydracus C. G. Thomson, remains under revision by the second author and thus no working key exists for the fauna of ECAS.To remedy this, we provide a regionalized Platydracus key in advance of the upcoming revision and describe a new species that occurs in ECAS. Multiple accidental introductions (Newton 1987; Majka and Klimaszewski 2008), a history of incorrect names (Newton 1987), inadequate species descriptions, colour variation, and the presence of several rare or typically ‘southern’ species has further complicated the recognition of Staphylinina in this region. Despite this, we show here that most Staphylinina can be easily identified to species using high-resolution photographs of readily visible characters. In this first publication we provide an overview of, and a key to, the twenty-two staphylinid subfamilies occurring in ECAS, and then review the tribes and subtribes of Staphylininae and the twenty-five species of Staphylinina occurring in ECAS. Keys presented here will also work for the fauna of Connecticut, Illinois, Massachusetts, Minnesota, Rhode Island and Wisconsin. We envision this first key as a nexus for future keys to link to, thus creating an integrated guide to the Staphylinidae of ECAS. Future publications are planned, with the most immediate ones covering the remaining groups of Staphylininae. Specimen photographs were taken with a Visionary Digital imaging system and CombineZ or Helicon Focus software was used to combine multiple photographs into high depth-of-field images. Most photographs of living specimens were taken with digital SLR cameras and a 105mm macro lens, often with the addition of a 2X teleconverter or extension rings, but live photographs were also contributed by a number of collaborators using a variety of equipment (see acknowledgments). Online keys were created with Adobe Creative Suite 3 software, including Photoshop, Illustrator, Dreamweaver and Fireworks. Maps of species distributions were prepared using ARC MAP, with records previous to 1970 mapped separately from those occurring on or after this year in order to highlight possible distribution changes over time (this was not done for common species). Most species in potential decline reviewed herein showed a noticeable change beginning around 1970, with a few species ‘declining’ in records after 1980. Thus, 1970 was chosen as a standard division point with special cases discussed under those species. Measurements were taken with an eyepiece micrometer using various dissecting microscopes. A list of institutions from which material was examined and a list of contributing photographers are given in the acknowledgements. Throughout, ‘abdominal segments 1-6’ corresponds to the segments numbered as visible and therefore represent anatomical segments 2-8. Unless otherwise stated, we follow the higher classification of Newton et al. (2000). A. Brunke would like to thank D. K. B. Cheung (DEBU) for technical assistance and essential training used to construct the interactive keys. A. Brunke also thanks D. K. B. Cheung and M. Jackson (DEBU) for assistance with mapping software and creation of custom maps. Thanks to J. Renkema (NSAC) and D. McAlpine (NBM) for bringing the presence of P. cinnamopterus in Nova Scotia and New Brunswick to our attention, respectively. We thank R. Webster (AFC) and A. Smetana (CNC) for recognizing the misidentification present in Klimaszewski et al. (2005). M. Thayer (FMNH) read an earlier version of the manuscript and provided many helpful comments. Funding for this project was provided in part by an NSERC PSG-M awarded to A. Brunke. A. Newton acknowledges U.S. National Science Foundation grant BSR-8906825 for support of databasing, dissection, and other activities in support of his ongoing revision of Platydracus, and thanks J. Klimaszewski for producing the aedeagal drawings of the P. cinnamopterus complex species used here (a more complete set of acknowledgments related to this revision will accompany its publication). C. Majka thanks the Board of Governors of the Nova Scotia Museum for ongoing support. Akre, R.D. and Hill, W.B. 1973. Behavior of Adranes taylori, a myrmecophilous beetle associated with Lasius sitkaensis in the Pacific Northwest (Coleoptera: Pselaphinae; Formicidae). Journal of the Kansas Entomological Society 46: 526-536. Alcock, J. 1991. 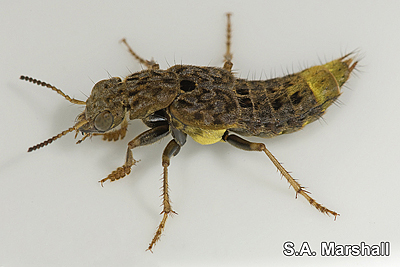 Adaptive Mate-Guarding by Males of Ontholestes cingulatus (Coleoptera: Staphylinidae). Journal of Insect Behavior 4: 763-771. Asenjo, A. and Clarke, D. 2007. First record of Creophilus maxillosus (Linnaeus, 1758) (Staphylinidae) for Peru. The Coleopterists Bulletin 61(4): 551-551. Ashe, J.S. 1981. Studies of the Life History and Habits of Phanerota fasciata Say (Coleoptera: Staphylinidae: Aleocharinae) with Notes on the Mushroom as a Habitat and Descriptions of the Immature Stages. The Coleopterists Bulletin 35(1): 83-96. Ashe, J.S. and Newton, A. 1993. Larvae of Trichophya and phylogeny of the tachyporine group of subfamilies (Coleoptera: Staphylinidae) with a review, new species and characterization of the Trichophyinae. Systematic Entomology 18: 267-286. Assing, V. and Wunderle, P. 1995. A revision of the species of the subfamily Habrocerinae (Coleoptera:Staphylinidae) of the world. Revue Suisse de Zoologie 102(2): 307-359. Balog, A., Marko, V., Kutasi, C.S. and Adam, L. 2003. Species Composition of Ground Dwelling Staphylinid (Coleoptera: Staphylinidae) Communities in Apple and Pear Orchards in Hungary. Acta Phytopathologica et Entomologica Hungarica 38: 181-198. Betz, O. 1998. Comparative studies on the predatory behaviour of Stenus spp. (Coleoptera: Staphylinidae): the significance of its specialized labial apparatus. Journal of Zoology 244(04): 527-544. Campbell, J.M. 1963. A revision of the New World Micropeplinae (Coleoptera: Staphylinidae) with a rearrangement of the World species The Canadian Entomologist 100: 225-267. Campbell, J.M. 1973. New species and records of New World Micropeplinae (Coleoptera: Staphylinidae). The Canadian Entomologist 105: 569-576. Campbell, J.M. 1982. Mitosynum vockerothi, a new genus and species of Coleoptera (Staphylinidae: Oxytelinae) from eastern Canada. . The Canadian Entomologist 114: 687-691. Campbell, J.M. and Davies, A. 1991. Family Staphylinidae. In Checklist of beetles of Canada and Alaska. Edited by Y. Bousquet. Agriculture Canada, Ottawa. pp. 84, 86-129. Casey, T. L. 1924. Additions to the known Coleoptera of North America. In Memoirs on the Coleoptera, Vol. 11. Lancaster Press, Lancaster, Pa.
Chatzimanolis, S., Cohen, I.M., Schomann, A.S. and Solodovnikov, A. 2010. Molecular phylogeny of the mega-diverse rove beetle tribe Staphylinini (Insecta, Coleoptera, Staphylinidae). Zoologica Scripta 39: 436-449. Cline, A.R. and Leschen, R.A.B. 2005. Coleoptera Associated with the Oyster Mushroom, Pleurotus ostreatus Fries, in North America. Southeastern Naturalist 4(3): 409-420. Cuccodoro, G. 1995. Two new species of Megarthrus (Coleoptera, Staphylinidae, Proteininae) and a note on 'water loading' behaviour. Journal of Zoology 236(2): 253-264. Cuccodoro, G. and Löbl, I. 1996. Revision of the rove beetles of the genus Megarthrus of America north of Mexico (Coleoptera, Staphylinidae, Proteininae). Mitteilungen der Münchner Entomologischen Gesellschaft 86: 145-188. Deichsel, R. 2006. Species change in an urban setting—ground and rove beetles (Coleoptera: Carabidae and Staphylinidae) in Berlin. Urban Ecosystems 9(3): 161-178. Dejean, P. F. M. A. 1821. Catalogue de la collection de Coléoptères de M. le Baron Dejean, lieutenant-général des armées du roi, commandeur de l'ordre royal de la légion d'honneur, chevalier de l'ordre royal et militaire de Saint-Louis. Crevot, Paris. Downie, N.M. and Arnett, R.H. 1996. The Beetles of Northeastern North America. The Sandhill Crane Press, Gainesville FL. Erichson, W. F. 1839. Genera et species staphylinorum insectorum coleopterorum familiae. F. H. Morin, Berlin. Frank, J.H. 1975. A Revision of the New World Species of the Genus Erichsonius Fauvel (Coleoptera: Staphylinidae). The Coleopterists Bulletin 29: 177-203. Frank, J.H. 1981. A revision of the New World species of the genus Neobisnius Ganglbauer (Coleoptera: Staphylinidae: Staphylininae). Occasional Papers of the Florida State Collection of Arthropods 1: 1-160. Gelmetti, C. and Grimalt, R. 1993. Paederus dermatitis: An easy diagnosable but misdiagnosed eruption. European Journal of Pediatrics 152(1): 6-8. Gravenhorst, J.L.C. 1802. Coleoptera Microptera Brunsvicensia. Brunsvigae. Grebennikov, K.A. and Newton, A. 2009. Good-bye Scydmaenidae, or why the ant-like stone beetles should become megadiverse Staphylinidae sensu latissimo (Coleoptera). European Journal of Entomology 106: 275-301. Hammond, H.E., Langor, D.W. and Spence, J.R. 2004. Saproxylic beetles (Coleoptera) using Populus in boreal aspen stands of western Canada: spatiotemporal variation and conservation of assemblages. Canadian Journal of Forest Research 34: 1-19. Hanley, R.S. and Goodrich, M.A. 1994. Natural History, Development and Immature Stages of Oxyporus stygicus Say (Coleoptera: Staphylinidae: Oxyporinae). The Coleopterists Bulletin 48(3): 213-225. Hanley, R.S. and Goodrich, M.A. 1995. Review of Mycophagy, Host Relationships and Behavior in the New World Oxyporinae (Coleoptera: Staphylinidae). The Coleopterists Bulletin 49(3): 267-280. Hanley RS (2001) Mandibular allometry and male dimorphism in a group of obligately mycophagous beetles (Insecta: Coleoptera: Staphylinidae: Oxyporinae). Biological Journal of the Linnean Society 72: 451-459. Hawkins, J.H. 1936. The bionomics and control of wireworms in Maine. Maine Agricultural Experimental Station Technology Bulletin No. 381: 146pp. Herman, L. 1975. Revision and phylogeny of the monogeneric subfamily Pseudopsinae for the world (Staphylinidae, Coleoptera). Bulletin of the American Museum of Natural History 155: 241-318. Herman, L. 1986. Revision of Bledius, Part IV. Classification of species groups, phylogeny, natural history, and catalogue (Coleoptera, Staphylinidae, Oxytelinae). Bulletin of the American Museum of Natural History 184: 1-367. Herman, L. 2001. Catalog of the Staphylinidae (Insecta, Coleoptera) : 1758 to the end of the second millennium. Bulletin of the American Museum of Natural History No. 265: 4218 p.
Hinton, H.E. and Stephens, F.L. 1941. Notes on the food of Micropeplus, with a description of the pupa of M. fulvus Erichson (Coleoptera: Micropeplidae). Proceedings of the Royal Entomological Society of London Series A, General Entomology 16(1-3): 29-32. Hobischack, N.R., VanLaerhoven, S.L. and Anderson, G.S. 2006. Successional patterns of diversity in insect fauna on carrion in sun and shade in the Boreal Forest Region of Canada, near Edmonton, Alberta. The Canadian Entomologist 138: 376-383. Hoebeke, E.R. 1978. Notes on the Biology of Codrus carolinensis (Hymenoptera: Proctotrupidae), a Parasite of Platydracus violaceus (Coleoptera: Staphylinidae). Journal of the Kansas Entomological Society 51(3): 507-511. Huth, A. and Dettner, K. 1990. Defense chemicals from abdominal glands of 13 rove beetle species of subtribe staphylinina (Coleoptera: Staphylinidae, Staphylininae). Journal of Chemical Ecology 16: 1573-1561. ICZN. 2003. Opinion 2039 (Case 3159). Staphylinus maculosus and S. violaceus Gravenhorst, 1802 (currently Platydracus maculosus and P. violaceus; Insecta, Coleoptera): usage of the specific names conserved. Bulletin of Zoological Nomenclature 60 (2): 164-165. Jennings, V.H. and Tallamy, D.W. 2006. Composition and Abundance of Ground-Dwelling Coleoptera in a Fragmented and Continuous Forest. Environmental Entomology 35(6): 1550-1560. Kellner, R.L.L. 2001. Horizontal transmission of biosynthetic capabilities for pederin in Paederus melanurus (Coleoptera: Staphylinidae). Chemoecology 11: 127-130. Kellner, R.L.L. and Dettner, K. 1995. Allocation of Pederin during lifetime of Paederus rove beetles (Coleoptera: Staphylinidae): evidence for polymorphism of hemolymph toxin. Journal of Chemical Ecology 21: 1719-1733. Klimaszewski, J. 1984. A revision of the genus Aleochara Gravenhorst of America north of Mexico (Coleoptera: Staphylinidae, Aleocharinae). Memoirs of the Entomological Society of Canada No. 129: 1-211. Klimaszewski, J. 2000. Diversity of the rove beetles in Canada and Alaska (Coleoptera, Staphylinidae). Memoire de la Societe royale belge d'Entomologie 39: 3-126. Klimaszewski, J., Sweeney, J., Price, J. and Pelletier, G. 2005. Rove beetles (Coleoptera: Staphylinidae) in red spruce stands, eastern Canada: diversity, abundance, and descriptions of new species. The Canadian Entomologist 137: 1-48. Klimaszewski, J., Langor, D.W., Work, T.T., Hammond, J.H.E. and Savard, K. 2008. Smaller and more numerous harvesting gaps emulate natural forest disturbances: a biodiversity test case using rove beetles (Coleoptera, Staphylinidae). Diversity and Distributions 14: 969-982. LeSage, L. 1977. Stades immatures de staphylins, I. La larve et la nymphe de Staphylinus cinnamopterus Gravenhorst (Coleoptera: Staphylinidae). Naturaliste Canadien 104: 235-238. Leschen, R.A.B. and Newton, A.F. 2003. Larval Description, Adult Feeding Behavior, and Phylogenetic Placement of Megalopinus (Coleoptera: Staphylinidae). The Coleopterists Bulletin 57(4): 469-493. Majka, C.G. 2010. Beetles in old growth forests: perspectives from the Townshend Woodlot, Prince Edward Island. Journal of the Acadian Entomological Society 6: 39-43. Majka, C.G. and Klimaszewski, J. 2004. Phloeocharis subtilissima Mannerheim (Staphylinidae: Phloeocharinae) and Cephennium gallicum Ganglbauer (Scydmaenidae) new to North America: a case study in the introduction of exotic Coleoptera to the port of Halifax, with new records of other species. Zootaxa 781: 1-15. Majka, C.G. and Klimaszewski, J. 2008. Introduced Staphylinidae (Coleoptera) in the maritime provinces of Canada. The Canadian Entomologist 140: 48-72. Majka, C.G., Klimaszewski, J. and Lauff, R.F. 2008. The coastal rove beetles (Coleoptera, Staphylinidae) of Atlantic Canada: a survey and new records. ZooKeys 2: 115-150. Majka, C.G., Chandler, D.S. and Donahue, C. 2011. Checklist of the Coleoptera of Maine, USA. Empty Mirrors Press, Halifax, Canada. Makranczy, G. 2006. Systematics and phylogenetic relationships of the genera in the Carpelimus group (Coleoptera: Staphylinidae: Oxytelinae). Annales Historico-Naturales Musei Nationalis Hungarici 98: 29-120. Mannerheim, C. G. 1830. Précis d'un nouvel arrangement de la famille des brachélytres, de l'ordre des insectes coléoptères. St. Petersburg. Mazur, A. 1995. Kusakowate (Coleoptera, Staphylinidae) towarzyszace zerowiskom ksylöfagow i wystepujace pod kora drzew [Rove beetles (Coleoptera, Staphylinidae) accompanying saproxylic insects under tree bark]. In Mat Konf Nauk, Puszczykowo, 220495 Szkodniki wtörne, ich rola oraz znaczenie w lesie [Secondary pests, their role and significance in forests]. Edited by A. Mazur. Wydawnictwo Acarus, Poznan, Poland. pp. 71-79. Motter, M.G. 1898. A Contribution to the Study of the Fauna of the Grave. A Study of Hundred and Fifty Disinterments, with Some Additional Experimental Observations. Journal of the New York Entomological Society 6: 201-231. Navarrete-Heredia, J.L., Newton, A.F., Thayer, M.K., Ashe, J.S. and Chandler, D.S. 2002. Guía ilustrada para los géneros de Staphylinidae (Coleoptera) de México. Illustrated guide to the genera of Staphylinidae (Coleoptera) of Mexico. Universidad de Guadalajara y Conabio, México. New, T.R. 2010. Beetles in conservation. Wiley-Blackwell, Oxford, UK. Newton, A.F. 1973. A systematic revision of the rove beetle genus Platydracus in North America (Coleoptera: Staphylinidae). Unpublished PhD. Thesis. Harvard University, Cambridge, Massachusetts. Newton, A. 1984. Mycophagy in Staphylinoidea (Coleoptera). In Fungi-Insect Relationships: Perspectives in ecology and evolution. Edited byQ. Wheeler, M. Blackwell. Columbia University Press, New York. pp. 302-353. Newton, A.F., Jr. 1987. Four Staphylinus (sensu lato) Species New to North America, with Notes on Other Introduced Species (Coleoptera: Staphylinidae). The Coleopterists Bulletin 41(4): 381-384. Newton, A.F. 1990. Insecta: Coleoptera: Staphylinidae adults and larvae. In Soil biology guide, 1137-1174. Edited by D. L. Dindal. John Wiley and Sons, New York, New York. Newton, A., Thayer, M.K., Ashe, J.S. and Chandler, D.S. 2000. Staphylinidae Latrielle, 1802. In American beetles: Archostemata, Myxophaga, Adephaga Polyphaga: Staphyliniformia. Edited by R. H. Arnett, M. C. Thomas. CRC Press, New York. O'Keefe, S.T. 2000. Ant-Like Stone Beetles, Ants, and Their Associations (Coleoptera: Scydmaenidae; Hymenoptera: Formicidae; Isoptera). Journal of the New York Entomological Society 108: 273-303. Paquin, P. and Duperre, N. 2001. Beetles of the boreal: a faunistic survey carried out in western Québec. Proceedings of the Entomological Society of Ontario 132: 57-98. Pohl, G., Langor, D., Klimaszewski, J., Work, T. and Paquin, P. 2008. Rove beetles (Coleoptera: Staphylinidae) in northern Nearctic forests1. The Canadian Entomologist 140(4): 415-436. Puthz, V. 1974. A new revision of the Nearctic Edaphus - species and remarks on other North American Euaesthetinae (Coleoptera:Staphylinidae). Revue Suisse de Zoologie 81(4): 911-932. Schmid, R. 1988. Morphologische Anpassungen in einem Rauber-Beute-System: Ameisenkafer (Scydmaenidae, Staphylinoidea) und gepanzerte Milben (Acari). Zoologische Jahrbucher, Abteilung fur Systematik, Okologie und Geographie der Teire 115: 207-228. Schmidt, D.A. 1994. Notes on the Biology and a Description of the Egg, Third Instar Larva and Pupa of Platydracus tomentosus (Gravenhorst) (Coleoptera: Staphylinidae). The Coleopterists Bulletin 48(4): 310-318. Schmidt, D.A. 1999. Materials and Methods for Rearing Selected Species of the Subfamilies Paederinae and Staphylininae (Coleoptera: Staphylinidae). The Coleopterists Bulletin 53(2): 104-114. Smetana, A. 1971a. Revision of the tribe Quediini of North America north of Mexico (Coleoptera: Staphylinidae). Memoirs of the Entomological Society of Canada No. 79: 1-303. Smetana, A. 1971b. Revision of the tribe Quediini of America North of Mexico (Coleoptera: Staphylinidae). Supplementum 1. The Canadian Entomologist 103: 1833-1848. Smetana, A. 1981. Ontholestes murinus (Linne 1758) in North America (Coleoptera: Staphylinidae). The Coleopterists Bulletin 35(1): 125-126. Smetana, A. 1982. Revision of the subfamily Xantholininae of America north of Mexico (Coleoptera: Staphylininae). Memoirs of the Entomological Society of Canada 120: iv+389pp. Smetana, A. 1990. Revision of the Subfamily Xantholininae of America North of Mexico (Coleoptera: Staphylinidae). Supplementum 2. The Coleopterists Bulletin 44: 83-87. Smetana, A. 1995. Rove beetles of the subtribe Philonthina of America north of Mexico (Coleoptera: Staphylinidae). Classification, phylogeny and taxonomic revision. Memoirs on Entomology, International 3: 945. Smetana, A. and Davies, A. 2000. Reclassification of the North Temperate Taxa Associated with Staphylinus Sensu Lato, Including Comments on Relevant Subtribes of Staphylinini (Coleoptera: Staphylinidae). American Museum Novitates No. 3287: 1-88. Snider, R.M. 1984. Diplopoda as food for Coleoptera: laboratory experiments. Pedobiologia 26: 205-212. Solodovnikov, A. and Schomann, A. 2009. Revised systematics and biogeography of 'Quediina' of sub-Saharan Africa: new phylogenetic insights into the rove beetle tribe Staphylinini (Coleoptera: Staphylinidae). Systematic Entomology 34(3): 443-466. Spence, J.R., Langor, D., Hammond, H.E. and Pohl, G. 1997. Beetle Abundance and Diversity in a Boreal Mixed-Wood Forest. Edited by Watt, A.D., Stork, N.E. and Hunter, M.D. Chapman and Hall, London. Stevens, C. and DeKimpe, N. 1993. Synthesis of stenusine, the spreading agent of the beetle Stenus comma. The Journal of Organic Chemistry 58(1): 132-134. Thayer, M.K. 2005. Chapter 11.7 Staphylinidae Latreille, 1802. In Handbook of Zoology: A natural history of the phyla of the animal kingdom. Edited by R. Beutel, R. Leschen. De Gruyter, New York. pp. 296-344. Voris, R. 1934. Biologic investigations on the Staphylinidae (Coleoptera). Transactions of the Academy of Science of St Louis 28: 231-261. Watrous, L. 2008. Contribution to the Taxonomic Inventory of Coleoptera at Cuivre River State Park, Lincoln Co., MO. Missouri Department of Natural Resources, Ballwin, Mo. Watson, E.J.G. 2004. Faunal succession of necrophilous insects associated with high-profile wildlife carcasses in Louisiana Ph.D. Thesis. Louisiana State University, Baton Rouge. Wheeler, W.M. 1911. Notes on the Myrmecophilous Beetles of the Genus Xenodusa, with a Description of the Larva of X. cava Leconte. Journal of the New York Entomological Society 19(3): 163-169. Wyatt, T.D. 1986. How a Subsocial Intertidal Beetle, Bledius spectabilis, Prevents Flooding and Anoxia in Its Burrow. Behavioral Ecology and Sociobiology 19(5): 323-331. Yamazaki, K. 2007. Coiling-up Defensive Behavior in the Rove Beetle Hypnogyra tubula (Sharp) (Coleoptera: Staphylinidae). The Coleopterists Bulletin 61: 453-454.